Why do you need mulch anyway? 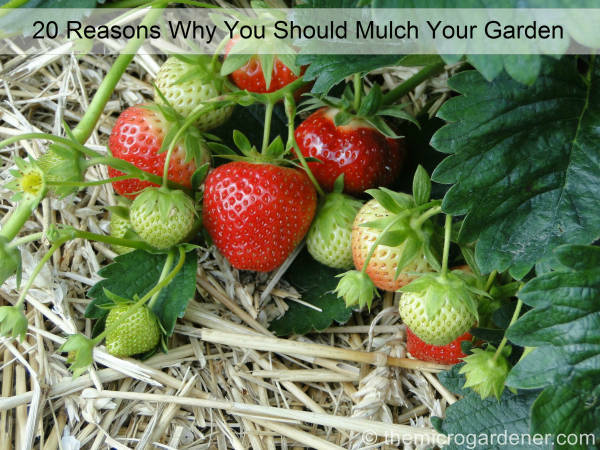 These are some of the reasons to use the ‘marvellous miracle of mulch’ in your garden. 1. Adds organic matter to your soil. This helps make your garden healthier and more resistant to pest and disease. (Saves money on pest control). There are many free sources of mulch like these yellow blossoms from my tree. Rather than making a slippery mess on the pathway (problem) I used them as a decorative & practical pot mulch (solution). 2. Provides valuable slow-release nutrients and prevents vitamin loss in plants. (Saves money on fertilisers). 3. Helps retain moisture in the soil for longer. Mulch prevents evaporation by shielding the soil from the sun. 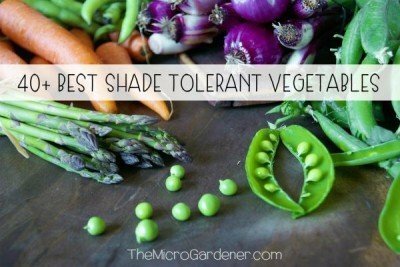 It also reduces water run-off during rain or watering. This reduces the amount of water needed. (Saves money). 4. Shades delicate seedlings from too much sun. (A mini umbrella). 5. Reduces time spent watering. (Saves time and money). 6. Is a great insulator by regulating soil temperature. Keeps roots consistently cool in summer and warm in winter. (Reduces plant stress). 7. Provides a natural barrier to stop weeds from growing and competing with plants for nutrients. How? By blocking the sunlight. You’ll find it easier to remove the few weeds that do grow. (Saves you time). 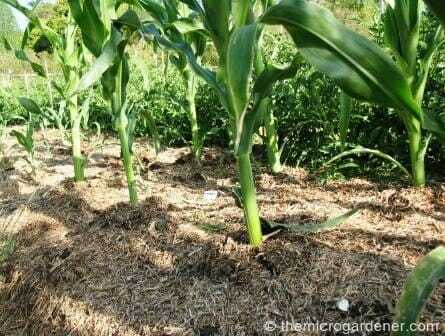 I have also used mulch to mound around sweetcorn stalks to support them as they develop roots. 8. 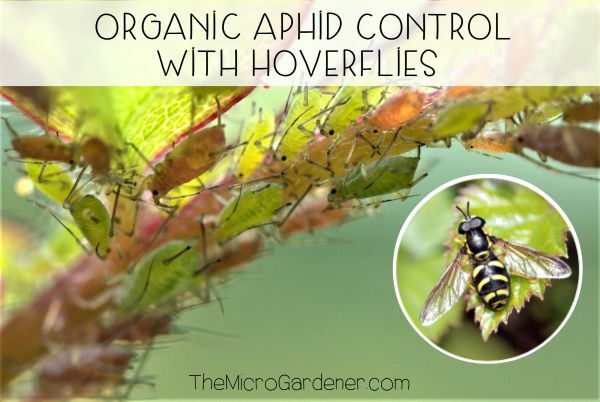 Increases biological activity in your soil. How? By providing beneficial micro-organisms and earthworms with food. 9. Improves soil conditions. Helps to bind sandy soils and open up clay soils. 10. Saves you time and energy cultivating the soil. 11. Stops nutrients from leaching out of the soil. 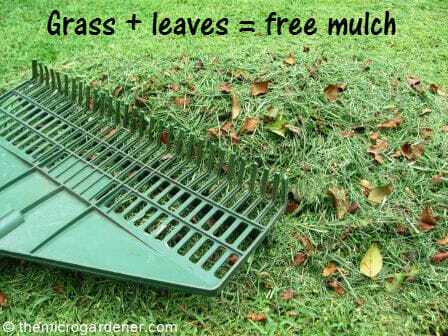 Free mulch resources are all around us – like lawn clippings and raked leaves. If you don’t have your own, solve your neighbour’s problem by offering to remove theirs! 13. Provides a clean surface for produce like fruit and nuts to fall, ready for harvesting. 14. Improves soil drainage and structure as it decomposes. 15. Provides support around plants especially young seedlings. 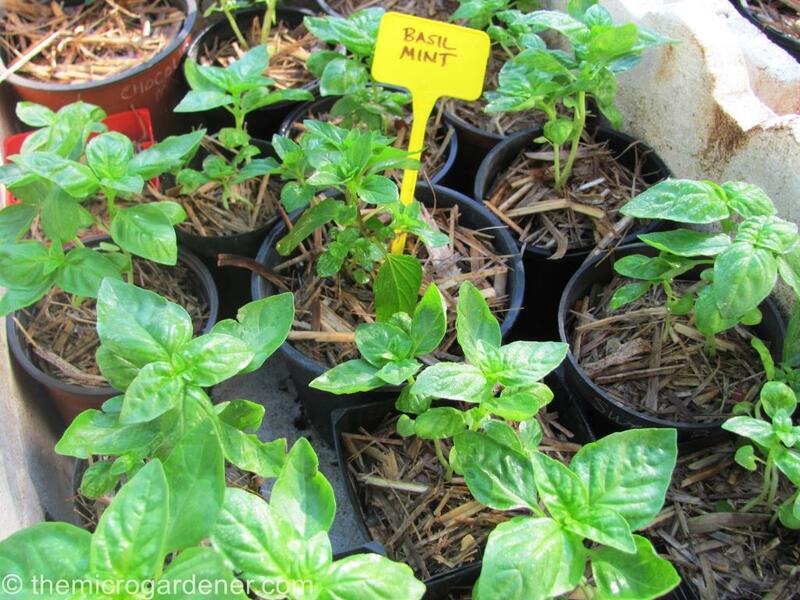 Use mulch to protect and support seedling stems in pots or after transplanting. 16. Recycles waste materials. e.g. 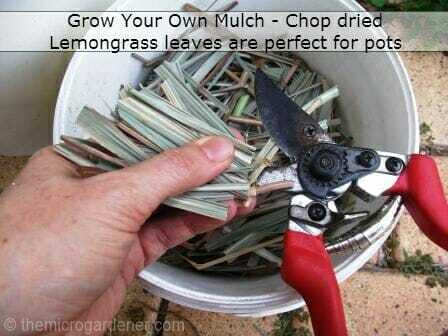 organic mulches like grass clippings and leaves. 17. Protects plants from mud-splash during watering or rain. 18. Prevents erosion and soil compaction particularly from foot traffic on pathways and play areas. 19. Improves the visual appearance of your garden. 20. 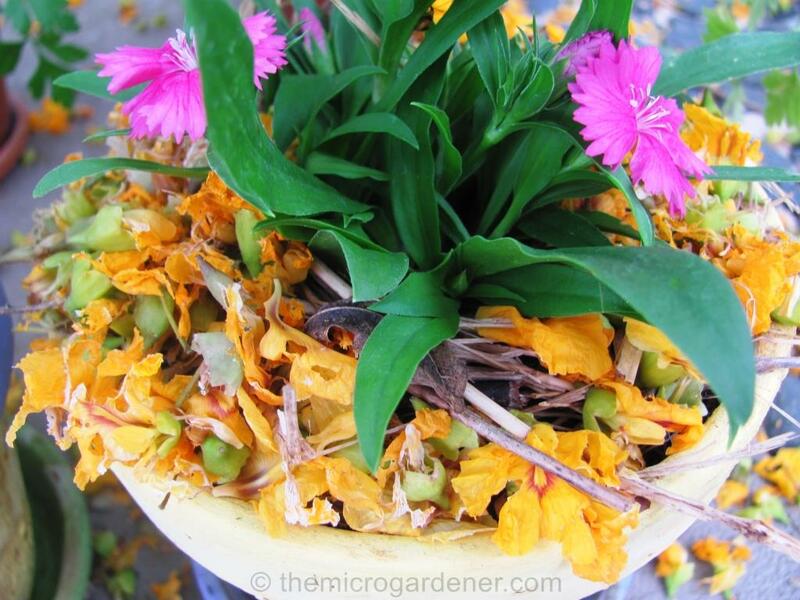 Can provide a home for plant-friendly insects. I grow lemongrass not only for culinary use in the kitchen but also as a source of fragrant mulch for my container gardens. So regardless of where you live and whether your plants are in pots or beds, mulch is a key ingredient for a successful organic garden. You got me when you said that mulching can help you to block sunlight which can help you to easily remove weeds. My husband and I want to have a green lawn. What we want is for our plants to be healthy and get the right amount of nutrition, so we’ll make sure to consider hiring a mulching service soon. Mulch is definitely an important aspect of gardening! 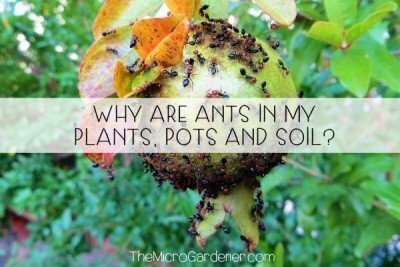 My garden is usually covered in mulch, I always mulch around small plants and newly germinated seeds. Thanks for sharing this helpful info! Anne, merci, pour tous vos conseils, moi je suis en France, dans le Morbihan, avec un micro climat, j’apprends beaucoup avec vous et j’adore jardiner! I grow a lot of Kale here in Vancouver. I’d like your opinion if Cypres tree and Pine needles residue (falled from tree and has spend rotting most of winter) mixed with sawdust would make a good mulch. I have about 1/2 m2 from a 96 sq feet 99% recycled green house I built. I was going to put it into my compost pit, but thought maybe I can put it a mulch around my kale plants. Also for growing garlic would you recommend buy garlic from local farmer markets. We are two and eat one full garlic every day in our food I cook Asian and stirr fry a lot. But when to plant it in a region like Vancouver where it rains a lot and we have coldish sometimes snowy winters otherwise very wet most winters. I have a full south exposure plot unused and could grow it there its above a stone wall so very well drained. Thanks love your blog. 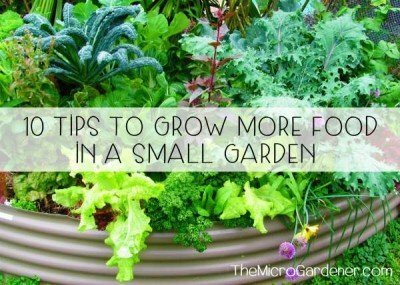 You’re growing a fantastic garden. Loved the pics of your kale ‘trees’ and raised beds especially. 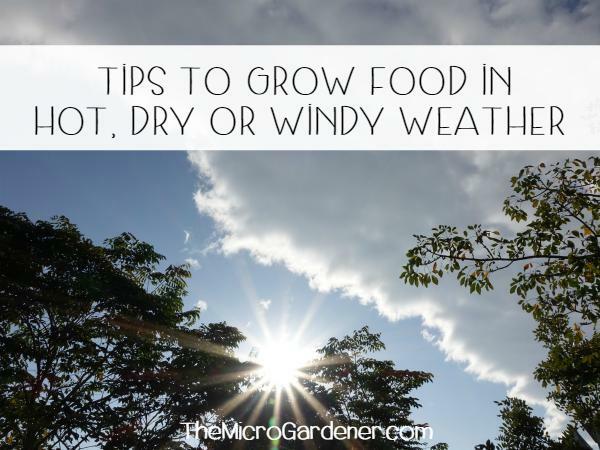 Despite your sunlight hours your soil must be good to produce healthy crops. The pine needle/sawdust (especially partly composted) make a great mulch – just need consistent moisture to ensure the microbes are active. These materials will add organic matter and slow release nutrients to your garden at the same time. They are also ideal ingredients in compost so you could add some to increase the variety of ingredients you use in your system. Re garlic, see my post on growing garlic [https://themicrogardener.com/5-step-guide-to-growing-gorgeous-garlic/] for more tips on suppliers and sourcing clean, organic bulbs. If you have any more questions, feel free to ask and thanks so much for your feedback. the tree is now ready to flower. It’s 10.00pm so I cannot take a photo but I will send you the result of your help. You make a lot of people happy. Everyday you were in my mind because I see that tree 8hours a day. Great to hear from you and that it’s happy news about your magnolia. I remember it was in a very sad state a year back when you sent the pics. I’d love to see an update and how it is now thriving under your care. Your patience has paid off! Thank you for your lovely comment and so thrilled my advice has made a difference. All of your newsletters and topics are so inspiring and much needed to have a good harvest. Thank you. What is the best kind of tomatoe for pot planting? I live in a subtropical area (Guatemala, Central America), with almost no temperature variation (between 80 to 72 all year round). Our dry season starts in November and I´m about to plant my garlic, for the first time!!! ; I´m excited!. Here are a few links with info that may help you learn about different varieties. http://goodmindseeds.org/?page_id=16; http://sustainableseedco.com/tomatoes/ and http://www.wintersown.org/wseo1/Your_Choice_Tomato_SASE.html has an extensive list you could research further. Or check my page on other sources @ https://themicrogardener.com/saving-and-sourcing-open-pollinated-seeds/. Hope this helps.